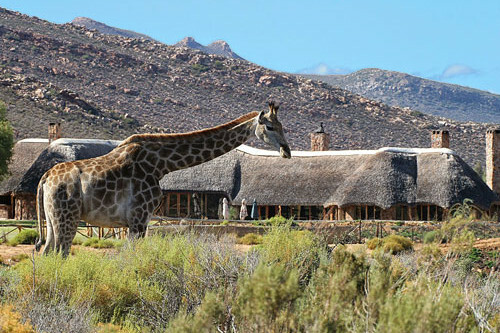 Discover the beautiful Mother City and its surroundings in the best possible way. 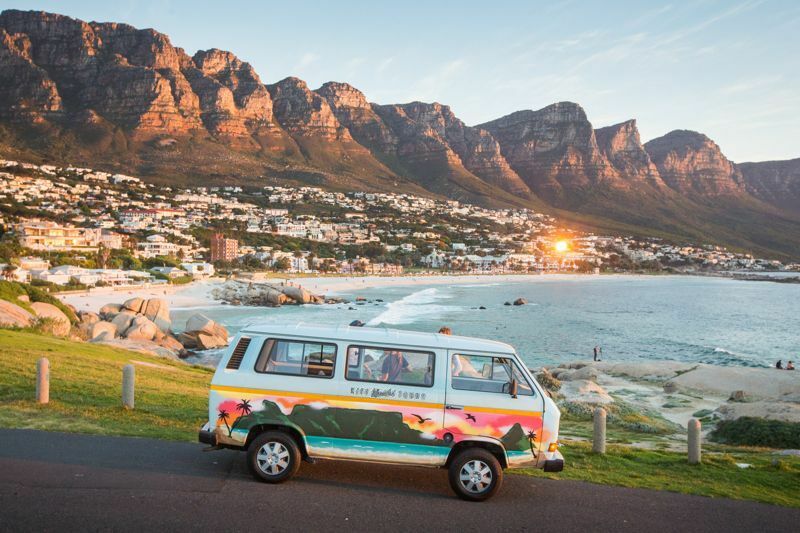 Get picked up by our guide in our awesome hand painted van and go on an epic adventure. No matter which day of the week you choose to go on this tour, you will always get a day full of mouth-watering goodness. 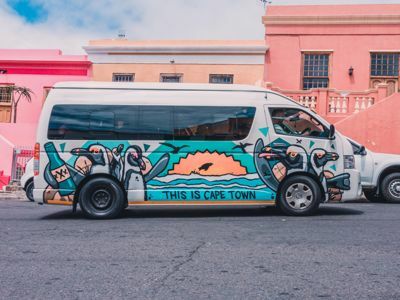 We will see some of the most beautiful street art in Woodstock, go for a beer and food paring tasting (or visit the old biscuit mill if its a Saturday) and visit the colourful Bo Kaap. This is only the start of the day. Wine tasting is done at one of Cape Towns most scenic wine farms. After we will go enjoy the views of Chapman’s peak and our secret sunset spot. 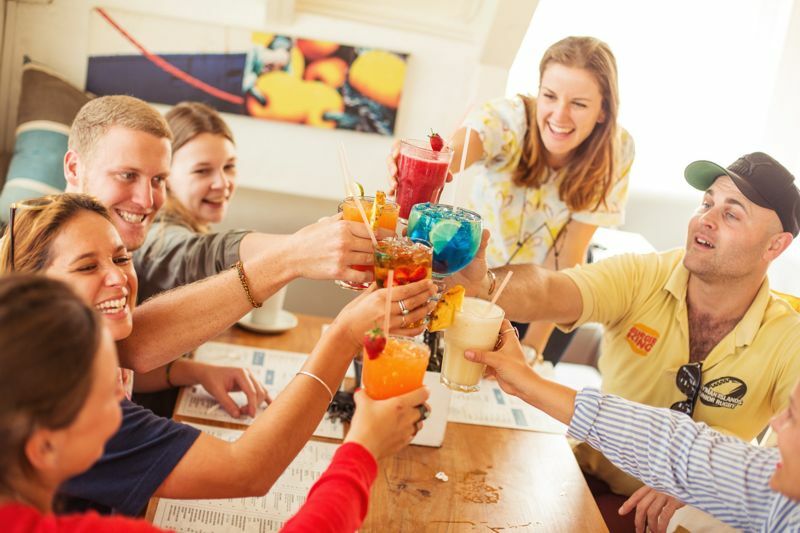 In Short, a day filled with Cape Town’s culture, history, landscape and food and drinks. What more could you ask for. Book now! Daily departure pick up from city bowl hostels/hotels between 11.30am and 12pm. 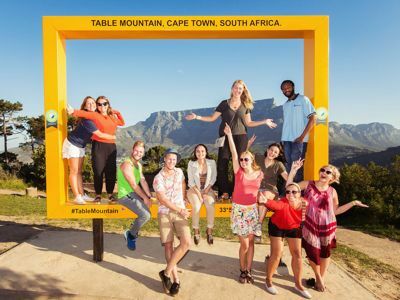 Experience the Mother City in one of the most authentic ways possible. District Six is a former inner-city residential area where over 60,000 of its non white inhabitants were forcibly removed during the 1970s Apartheid regime. Cape Town boasts an array of street art which serves as a powerful voice and is available for everyone to see. 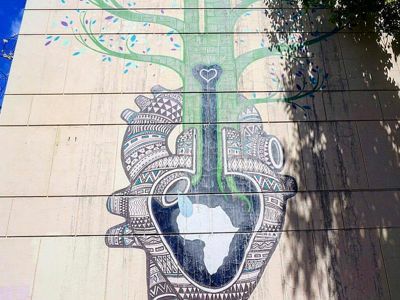 You’ll be shown through the streets of District Six and shown graffiti that touches on social issues, murals that speak of a deep connection to Africa, and abstract paintings of things meaningful to the local residents. We also travel through the once infamous suburb of Woodstock. A street art initiative was started many years ago to uplift the area for the local residents. We take you through the narrow roads to show you the neighbourhood as it stands today. Good luck choosing your favourite ones, as there is a wide variety of talent on display. It’s 5 O’Clock somewhere in the world and everyone knows what that means, which is why the next stop is the Devil’s Peak Tap Room. Home to arguably the best beer in South Africa, the Devil’s Peak Brewing Company has grown enormously from its humble garage beginnings in 2012. They now offer 11 craft beers, including their award-winning flagship, the King’s Blockhouse IPA. 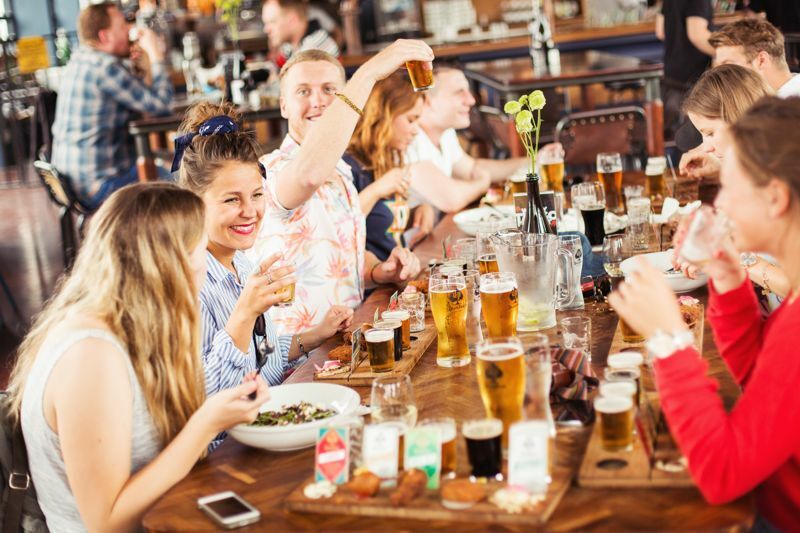 Enjoy a meal and drink or try our recommended beer and food pairing as you take in the magnificent view of the Devil’s Peak mountain. And for those of us who don’t quite fancy beer, wine is available as well. We’ve skirted around the outside of town, and now it’s time to go straight through. Next up is a visit to the colourful Bo-Kaap neighbourhood, where the houses are painted in all colours of the rainbow – and more. Formerly known as the Cape Malay Quarter, the multicultural residents of this old district have brightened up the entire city with their daring and vibrant colour schemes. Learn about their origins and how this place came about. 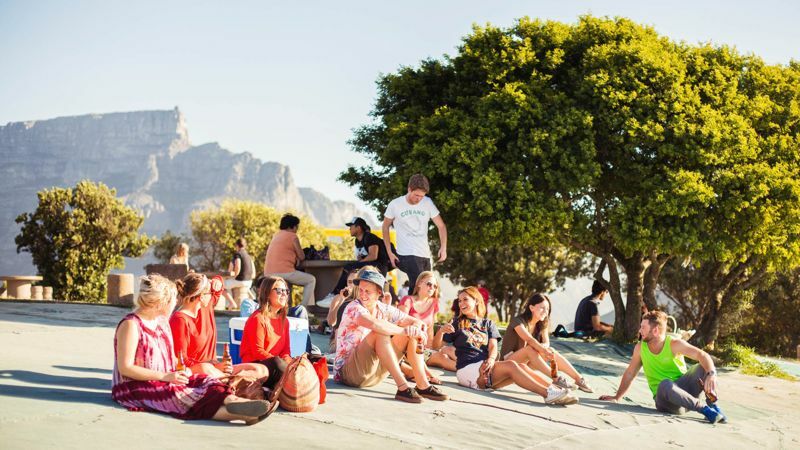 If you’re looking for a way to feel the true spirit and energy of Cape Town locals, this is the best way to do it. Just as you thought it couldn’t get anymore scenic, we take a left turn for a dirt road leading to Cape Town’s most stunning winery. 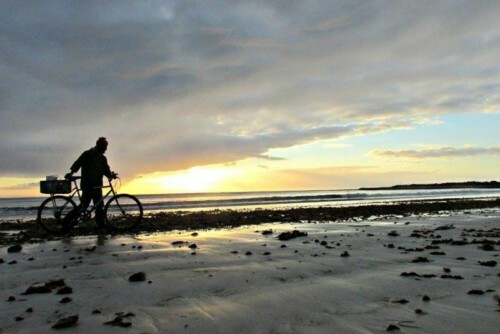 Located in the sleepy town of Noordhoek, take in the quiet beauty of the long beach of Noordhoek as well as the dramatic mountain range in front of you. This town is famous for its countryside meet beach vibe. 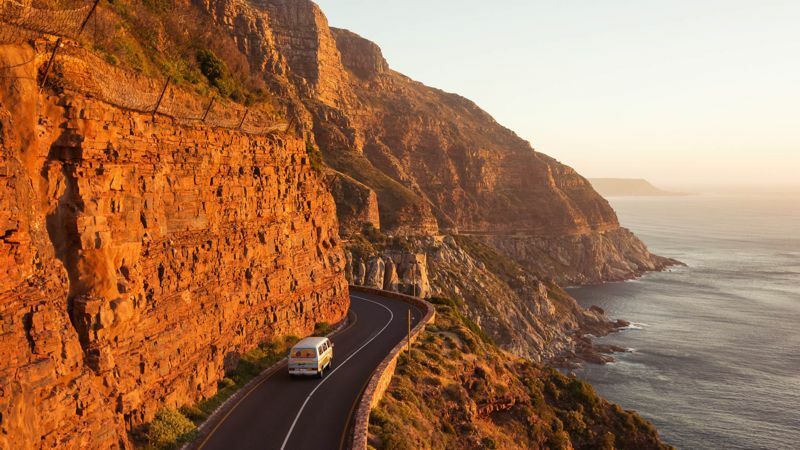 You may have glanced up and seen Chapman’s Peak Drive while walking along Hout Bay Beach. 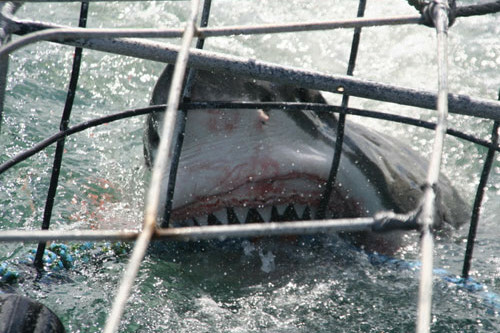 Hey, you may have even seen it in a few movies or adverts. And soon you’ll see why it is thought of as one of the most scenic drives in the world. Carved out of the rock face, the slow winding road offers jaw-dropping views of Noordhoek, Hout Bay, and the Atlantic Ocean. The various stopping points along the road offer prime views for that perfect Instagram photo – no filter needed. Dolphins and whales are not an uncommon sight in the deep blue waters, so keep an eye open. The day will be coming to an end shortly, and the Cape is famous for her sherbert sunsets. The only way to get the complete view is to chill out with a sundowner drink perched on some boulders overlooking the ocean. 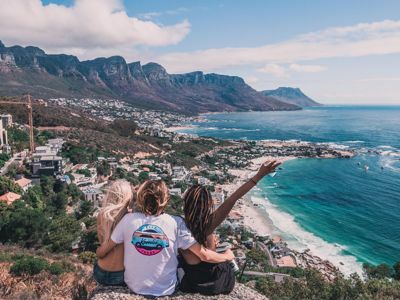 We will take you to our secret spot for perfect views from Africa’s most expensive suburb with the backdrop of the immense Twelve Apostles mountain range, the western horizon, so you can watch the sun go down in African style. In Summer, you won’t be seeing the sun set till late so just sit back and bathe in Africa’s warmth.